Forget what you thought you knew about white chocolate because this Akesson’s Single Plantation Chocolate Madagascar Bejofo Plantation 43% White Chocolate bar is a game changer. If you’re like me (and I know I am) I think vanilla, and tooth aching sweetness when I think of typical white chocolate. Not so with this bar. In fact, there isn’t even any vanilla in it for starters. Then let’s talk about cocoa butter. Cocoa beans contain a high percentage of cocoa butter. Some beans contain even more then 50% of the stuff. Cocoa butter used to always be deodorized before being added to chocolate bars. Now more, and more chocolate makers are experimenting with either pressing cocoa butter from their own cocoa beans, and/or not using deodorized cocoa butter. Instead they let any naturally occurring flavors remain which in turn enhances the characteristics of the white chocolate. 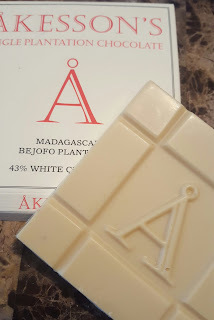 Akesson’s bar boast being the first single-estate white chocolate bar made from cocoa butter from their plantation in the Sambirano Valley in Madagascar. This bar is made up of 43% cocoa butter, organic milk powder, and organic sugar. Nose: I actually get the same feeling in my nose if I were to sniff peppermint, but not the actual scent of mint. Taste: Cream, buttery, hint of spice, quality buttermilk taste, a little salty (but not salt added). Finish: Buttermilk, and saltiness continues in the finish. Have you had this bar? What is your favorite white chocolate? Note: This review first appeared in my original Blogspot site on 1-15-17.